As Dan wrote earlier, ABC News is reporting that Marco Rubio is taking "concrete steps" toward running for president in 2016, forgoing a Senate re-election campaign in Florida. He'd been shuffling forward with baby steps previously; this seems like a leap in that direction. He has stated unambiguously in the recent past that he would not run for two offices simultaneously and denied that he'd angle for the state's Republican-controlled legislature to change existing law to allow him to do so. This would be an all-in proposition. It's conceivable that he could run in the presidential "proto primary," gauge how he fares, and possibly file in time for a Senate re-election effort if he gets the sense that his chances of securing the nomination are less robust than he'd hoped. But if he proves to be major player this cycle -- and given his talent and existing brand, with the 'beware Zogby polls' caveat in place, that's a strong possibility -- he'll either end up as President (or Vice President) of the United States, or out of government. Rubio has obviously weighed all of the various factors carefully and decided to take this gamble, but it most assuredly is a gamble. Why? (1) The Jeb and Money Factor: He'll be challenging his mentor, Jeb Bush, head-to-head, bucking the conventional wisdom that this scenario was far fetched. 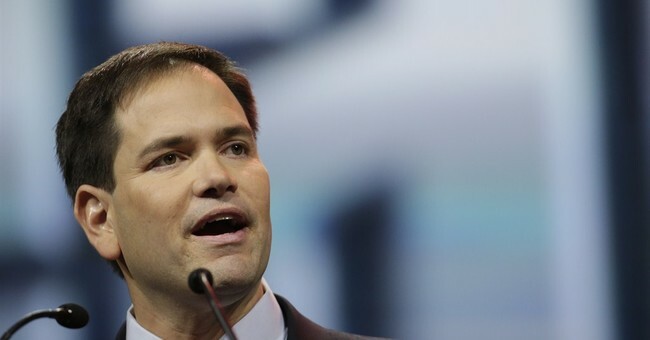 The Senator has been pouring cold water on the notion that the two couldn't run against each other for a few months, but the potential setbacks Rubio might incur by doing so aren't insubstantial. Bush is honing a fundraising juggernaut, gobbling up crucial major Florida donors; can Rubio raise the type of cash he needs to run a serious primary campaign with one of his arms tied behind his back? (2) Primary Pitfalls: Rubio was elected to the Senate in the 2010 wave as a Tea Party candidate. He's developed a conservative voting record over four years in the upper chamber and is a powerful advocate on behalf of conservative causes. But in many conservative voters' minds, his membership among the so-called 'Gang of Eight' on immigration reform is a serious black mark on his score card. Some may respect his effort to tackle a difficult problem, but the base was almost uniformly against the flawed legislation that ultimately emerged, which Rubio tirelessly promoted and defended. He's changed his tune a bit since the bill died in the House, sharply criticizing President Obama's executive amnesty; might this quasi flip-flop assuage conservatives' concerns? By the same token, might it be a general election vulnerability? In any case, it seems clear that there will be room to his left and right in the primary field -- which may actually end up being a sweet spot for him. He's one of a handful of prospective candidates who could eventually fit the bill as a consensus/compromise nominee, with another being Scott Walker. (3) Senate Landscape: Given the strength and size of the field that's shaping up, as well as Hillary Clinton's very formidable early position, even Rubio's most ardent fans must concede that there's a good chance that he will not be the next president. If that's the case, and assuming that he's not selected as a running mate on a successful ticket, Rubio is probably doing Senate Democrats a favor. His seat is up in 2016, and it'll be a battle either way. Rubio won a three-way race decisively in 2010, but only secured a plurality of the vote at 49 percent. In a presidential year, he would be the favorite, but not a shoo-in, to win a second term. Recall that Florida went blue in 2008 and 2012, and red in 2010 and 2014. If the state GOP needs to find someone else to hold that now-vacant seat (especially if the Democrats put forward a competitive/tough to pigeonhole nominee), there is a much greater chance of it being lost than if Rubio stays put. (4) The Youth Factor: Rubio will be 45 on Election Day 2016, having served in the Senate for nearly one full term. He's emerging as an important and influential voice in that body, earning respect from his colleagues as a serious person. Walking this high-stakes tightrope places all of this work and his still-ascendant role within the party in jeopardy. Let's say he were to sit out the 2016 race, and a different Republican won. His earliest shot at another White House bid would be eight years later, when he'd be all of 53 years old. The same timeline could apply if Hillary wins and becomes a two-term president. Another wrinkle could be a 2020 challenge if Rubio decides she looks vulnerable. Either way, 12 to 16 consecutive years of Democrats in the White House would make the GOP desperate to win, and Rubio could present himself be a attractive option who checks an awful lot of 'boxes' for the party -- and who had never run previously. If he were to wait, Rubio could use the intervening years to burnish more credentials, consider a run for governor, and develop a few gray hairs that may help offset his very youthful appearance. His options, in other words, would be wide open. Sure, new and competing "rising stars" will certainly emerge over time, but Rubio's seasoning could put him at the head of the class well into the future. But, however, if he really is running in 2016, he'll be putting a lot of eggs into a single basket and potentially limiting his political future if he doesn't prevail. As I stated at the outset, Marco Rubio is a smart man and a skilled political operator. Let's stipulate that nothing mentioned above comes as news to him. He's undoubtedly considered and agonized over all of the evidence, hypotheticals and dynamics, and has apparently arrived at the conclusion that 2016 is his moment. We'll know soon enough whether his gamble pays off.